Acid reflux, also referred to as gastroesophageal reflux disease or GERD, is a chronic condition in which liquids mixed with stomach acids within the stomach and begin to back up into the esophagus. According to Cure Research, 5 million Americans suffer from chronic heartburn or acid reflux. Natural solutions are a popular alternative to conventional medications for many medical conditions, and when it comes to acid reflux, it is possible to find relief with the applesauce cure. To effectively treat acid reflux it is important to both understand and identify it. Acid reflux is a condition in which naturally occurring stomach acids mix with pepsin and travel into the stomach and esophagus. The substances cause a burning sensation due to the acid and pepsin content. This mixture of stomach acids and liquid can damage the lining of the esophagus. Symptoms of acid reflux include a heavy burning sensation in the stomach, chest and throat. In addition, there can be a sour, hot or acidic taste in the back of the throat, difficulty swallowing or a heavy feeling in the stomach. Soothe the stomach by encouraging the body to stop the natural production of stomach acid. According to The Complete Idiot’s Guide to Herbal Remedies by Frankie Avalon Wolfe, apples along with pears and bananas are easily digestible as well as slightly moist. This makes apples effective as a food that won’t tax and overly worked digestive system. However, there are other reasons that apples and applesauce, an acid food, help to relieve indigestion. 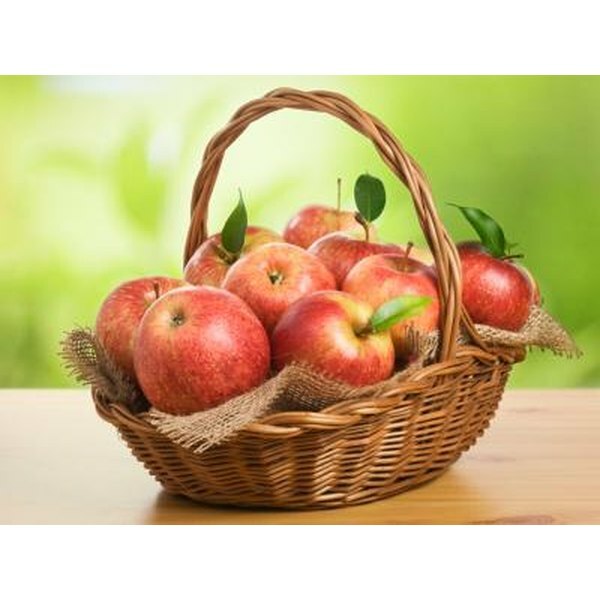 Apples and other foods with high acid content trigger the digestive system to stop producing stomach acid. Applesauce, specifically applesauce made from Cortland or Brayburn apples, soothes both the stomach and the esophagus. According to Collective Wizdom, a healthy lifestyles website, the cool and wet consistency, which resembles slush, is perfect for relieving the burning sensation while encouraging the body to halt acid production. Use applesauce to both stop acid reflux and prevent future outbreaks. One of the most common applesauce regiments for acid reflux is to ingest one tbsp. of applesauce three times daily. This will provide a constant soothing effect as well as prevent stomach and esophagus damage. For heartburn sufferers who frequently wake up during the night with uncomfortable symptoms, eat approximately one-fourth cup of applesauce following dinner. Use homemade applesauce made with honey as opposed to traditional processed sugar. Fats and processed sugar often trigger acid reflux and should be used sparingly. In addition, applesauce can be used as a substitute to fatty food additives. For example, applesauce can be used in baking as a fat substitute. Brownies, cookies and other baked goods can be made using applesauce instead of butter or shortening in an attempt to prevent heartburn. Applesauce can also be used as a butter substitute on foods such as fresh rolls and biscuits. Doing this will prevent acid reflux from occurring.